The Loko occupy a large section of Sierra Leone and a small area in Guinea below the Fouta Djallon region. They live on a land of gently rolling coastal plains broken by rocky spurs of the Fouta Djallon highlands. In this tropical region, the average temperature is about 82º F., with 65 to 95 inches of rain falls annually. Baboons, hyenas, and antelope are common in the area, as are snakes and crocodiles. The population of Sierra Leone is composed predominantly of black Africans belonging to a number of different ethnic groups. The two largest groups are the Mende in the south and the Temne in the north. Creoles (descendants of freed slaves returned from the Americas) are an important minority living in the Freetown area. The Loko were among the slaves shipped to America while slavery still existed. Today, they are close neighbors of the Bande. They speak a Niger-Congo language that is also called Loko. The economy of Sierra Leone is based primarily on agriculture and mining. Like most of the tribes in West Africa, the Loko are primarily farmers. Rice, the staple crop, is grown both in the swamps and on the hillsides. Other important crops include manioc, corn, potatoes, peppers, and bananas. In addition, house gardens supply other vegetables, fruits, and nuts for each family. Oil palms flourish in this region of Sierra Leone. The trunks, branches, palms, nuts, and sap of these trees are all used and highly treasured. Soap, wax, wine, oil, and baskets are just some of the items produced from the palms. Loko villages are grouped together at the bases of hills, in the open plains, or on the valley floors. Usually, a small group of compact huts makes up a village. These huts are round, with wooden walls and cone-shaped, thatched roofs. 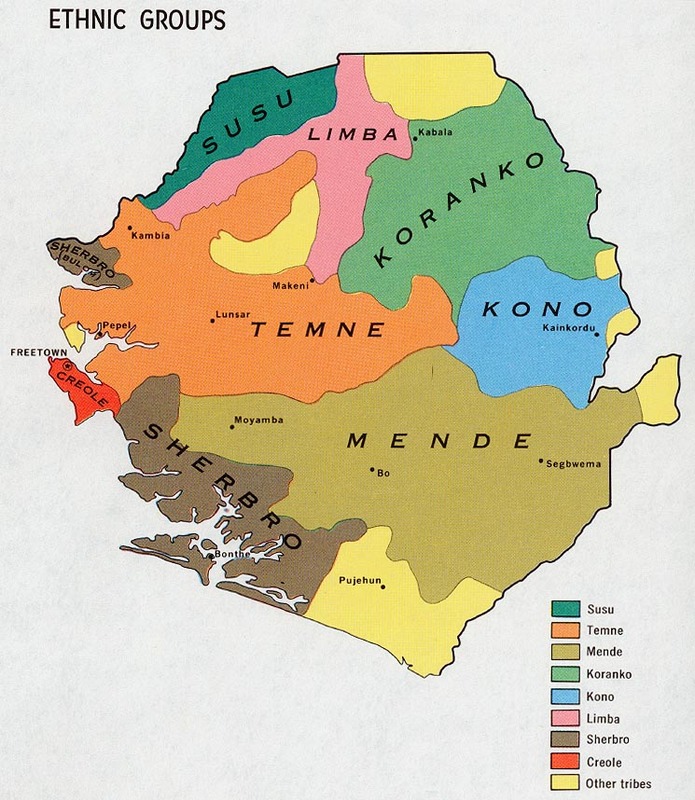 The Loko are divided into nine districts, with each being ruled by a chief. Each village in the district is ruled by a headman, who answers to the chief. The Loko are a family-oriented people, and a village is generally made up of a family lineage. The Loko are also said to be open-minded, cooperative, and open to outside influences. Loko society is basically patrilineal, which means that they trace their lineage through the males. Polygyny (having more than one wife) is practiced by many of the men. Before a Loko man marries, he must first pay a bride-price to the girl's parents. The Loko are engaged in several crafts, such as basketry, cabinet making, and net making. In addition, they participate in many important ritual festivities and ceremonies throughout the year. Much dancing accompanies these events. In the early 1990s, the estimated life expectancy in Sierra Leone was only 49 years of age for women and 43 years for men. The infant mortality rate was among the highest in Africa, with 145 infant deaths per 1,000 live births. Medical personnel and facilities were grossly inadequate for meeting the needs of the people. The Loko of Sierra Leone are ethnic religionists, practicing traditional pagan beliefs. A small segment of the population is Christian. Many of the Loko believe in witches who can be either male or female. These witches are believed to derive pleasure from causing accidents and spreading sickness among the tribe. As a result, many Loko fear witches and carry charms or medicines with them to ward off their evil acts. Considerable effort is being made to reach the Loko. In addition, the New Testament is available in their native language. Leadership development and discipleship materials for new believers are essential in order to continue the growth of the Church among the Loko. * Scripture Prayers for the Loko, Landogo in Sierra Leone. * Ask the Lord to send missionaries to live and work among the Loko of Sierra Leone. * Ask the Holy Spirit to grant wisdom, favor, and unity to missions agencies focusing on the Loko. * Pray that evangelical literature and discipleship materials will be translated into the Loko language. * Pray that signs and wonders will follow the Loko believers as they share Christ with their families and friends. * Ask God to raise up intercessors who will faithfully stand in the gap for the Loko. * Ask the Lord to bring forth a holy and vigorous Loko church for the glory of His name!